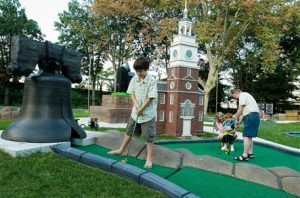 Cari Feiler Bender, Philadelphia mother of 2, recommends Historic Philadelphia, Inc. for a family vacation or local family outing in Philadelphia with kids of all ages. “For little ones, take the Colonial Kids Quest Tour, where young adventurers help Colonial characters (and their puppet animal friends) find a missing copy of the Declaration of Independence just in time to be read to the public for the first time. For children 8 and up, the brand new Valley Forge Secrets & Spies Tour, visitors will learn 18th-century counterespionage tactics to help save General Washington. And for kids of all ages, there are FREE storytelling benches throughout Historic Philadelphia and Valley Forge telling captivating stories of history RIGHT WHERE THEY HAPPENED. This year, for the first time, hear Stories from the Underground Railroad at each of the 13 benches. Only insiders know that you need a “secret password” to hear the next part of the story at the next bench. Start at the Signers’ Garden bench and work your way around the Historic District, seeing all the great sites and hearing incredible tales. Cari Feiler Bender of Historic Philidelphia, Inc. has two kids, 6 and 9, who love all of the above. They clamor for Franklin Square and can’t wait for the storytelling benches which run all summer.